I was on the way back from ZhongShan when I got myself caught in a slow moving jam on the highway. So there I was sitting stuck in the car and twiddling my thumbs when this truck pulled alongside. Good thing the car was air conditioned or I would have died from the smell of a hundred ducks and their poos up close. And there I was staring at the ducks and them back at me. Obviously, they are heading to be market and subsequently onto the dinner table. Hmm, they all looked so serene and at peace just sitting there for the ride. Aloe: Indeed. Dead Duck too. Ollie: Why I wonder if the ducks know where they are headed. Then again, it is said that animals have that sixth sense ahead of their impending demise. It's debatable. I know the following qns is stupid but: Can all ducks fly? I always thought ducks can fly (as compared to chicken) but a few wks ago, my mum told me farm ducks can't fly; only wild ducks can... is it true? okiedokie: My guess is that farm ducks can fly. 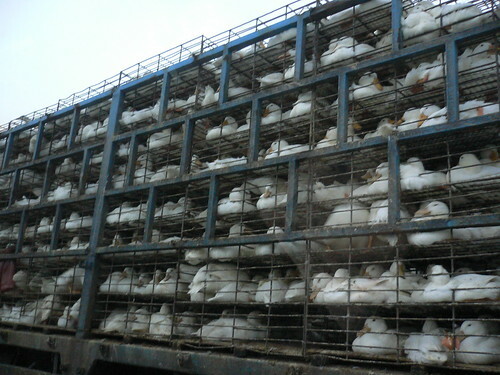 However, as the name "farm ducks" suggest, these ducks are probably over weight and caged up since young i.e. no chance for them to develop the necessary muscles for flight. I am not surprised if their wings are clipped as well.